Popular for the masses of flowers produced in large groups or clusters Floribunda Roses have been made famous by the ‘Iceberg Rose’ a floribunda introduced by Kordes in Germany, that went on to conquer the world. 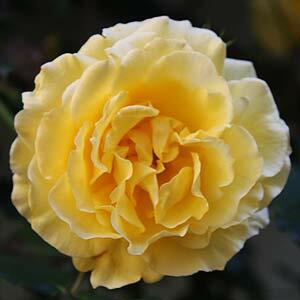 With the well known masses of flowers in large trusses floribunda roses are one of the easiest roses to grow. So the name ‘floribunda’ actually means ‘abundant blooms’. Floribunda roses are vigorous, long flowering and offer a wide range of flower forms and colors. So its the flowering pattern of producing blooms in large clusters that distinguish floribunda roses from Hybrid Tea roses which tend to produce single flowers or small groups of up to three or so. Floribunda are sometimes called landscaping roses. However they come in different forms including groundcover roses and floribunda roses are also available as standard roses. A slow release specialist rose food in early spring and again in late spring usually is enough. Remember to mulch well to keep the root run cool and moist as for all roses. 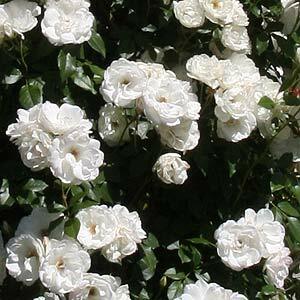 The best known floribunda rose, ‘Iceberg’.